The nephew of Lucien Bianchi - who won Le Mans in 1968 and drove in 19 grands prix, scoring one podium - Jules first took to a kart at the age of three and began racing at five. In 2003 Bianchi was signed up by Maranello Karting before making his debut in single seaters four years later. His first year was in Formula Renault 2.0 and saw him win the French championship. Managed by Nicolas Todt, Bianchi moved up to the F3 Euro Series in 2008, finishing third overall, and then won the championship with nine wins the following year. Following that achievement he was awarded a Ferrari test and became the first driver to be signed up to the Ferrari Driver Academy. GP2 was the next logical step and Bianchi finished the 2010 season in third place in the championship with 52 points. Though he could only go one point better in 2011, Bianchi was named as Force India reserve driver ahead of the 2012 season. After impressing the team, a winter-long saga saw Bianchi eventually miss out on a race seat at Force India at the final test in Barcelona when Adrian Sutil was named. But just 24 hours later he was on the grid anyway, replacing Luiz Razia at Marussia after the Brazilian failed to resolve funding issues. 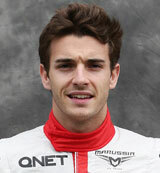 Bianchi's debut season was a success, with his early performances in particular catching the eye and it was announced at the start of October that he would remain with Marussia for a second season in 2014. It proved to be a breakthrough campaign overshadowed by a horrible crash at Suzuka. Bianchi had underlined his credentials as a future Ferrari senior driver by taking Marussia's first points in a superb drive at Monaco, while he also made Q2 on three occasions during the season. He also tested for Ferrari at the in-season test and was close to securing a drive at Sauber for the following season. However, he suffered a severe brain injury at the Japanese Grand Prix after aquaplaning off the circuit and hitting a recovery vehicle.